Principle of microdialysis as depicted by a schematic microdialysis probe placed in a tissue. An artificial extracellular fluid perfusion medium such as artificial cerebrospinal fluid is delivered through the microdialysis probe inlet tube. As the perfusion medium passes the active dialysis area, solute moves in both directions across the dialysis membrane. 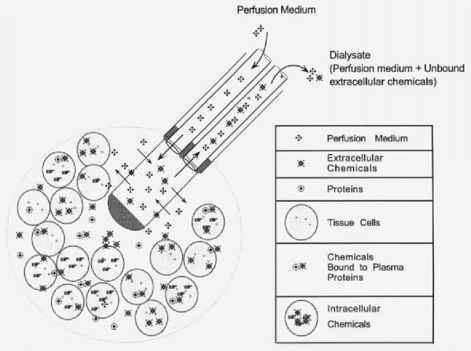 The perfusion medium collects extracellular solute via the process of dialysis and the dialysate containing the solute of interest is delivered from the outlet tube. allow continuous sampling of molecules from extracellular fluid of animals and man. The principle of microdialysis is illustrated in Figure 11.1. A microdialysis probe is composed of a tube-like dialysis membrane or fiber attached to two rigid or semirigid transport tubes. Both the inlet and outlet transport tubes, as well as the dialysis fiber, are hollow. Although dialysis probes are quite small (200 to 600 ^m in diameter), they can accommodate passage of several microliters of liquids through their lumen each minute. When used in experiments, the membrane portion of the probe is placed in the extracellular space of a tissue or tissue matrix and a liquid perfusion medium is pumped continuously through the dialysis fiber lumen. This perfusion medium usually has an ionic and osmotic composition similar to the extracellular fluid, but lacks the chemicals that are intended to be sampled. This way, molecules that can travel across the membrane diffuse into the medium from the extracellular space when the perfusion medium passes through the fiber. The perfusion medium at this point is termed dialysate as it contains the molecules from the extracellular space by virtue of dialysis. In some situations, the perfusion medium may contain an excess of certain chemicals such as a drug which can diffuse out into the extracellular space. There are several types of dialysis membranes appropriate for use in microdi-alysis. All membranes are semipermeable and allow passive entry of molecules that can readily diffuse through its complex porous maze. The solutes with molecular weight lower than the permeability allowed by the membrane are the only substances that can diffuse through the membrane. While microdialysis fibers have been used to sample the chemistry of the extracellular fluid of many organs and tissues, most applications of microdialysis techniques to studies of epilepsy have involved placement of the microdialysis fiber into specific brain regions or specific nuclei. When used to dialyze brain extracellular fluid, the perfusion medium usually has an ionic and osmotic composition that is similar to cerebrospinal fluid. Most brain dialysis experiments involve sampling the extracellular fluid for neurotrans-mitter concentrations or for concentrations of a drug. For these applications, the contents of the artificial cerebrospinal fluid (ACSF) dialysate usually are analyzed by high-performance liquid chromatography (HPLC). An advantage of microdialysis for studies of brain chemistry is that the technique allows continuous sampling of low-molecular-weight substances in the extracellular fluid. Neurons store relatively large concentrations of neurotransmitters intracellu-larly. This stored neurotransmitter does not have functional significance until it is released as part of the process of chemical neurotransmission. Neurons release neurotransmitter into the extracellular or synaptic space when they are stimulated. This extraneuronal neurotransmitter interacts with receptors on other cells to produce a response. Since microdialysis allows sampling of the extracellular neurotransmitter, it provides a direct estimate of the neurotransmitter available to interact with cellular receptors. Earlier techniques for estimating extracellular or functional neurotrans-mitter (e.g., turnover rate or isotopic dilution measurements) required large numbers of animals and allowed only a single estimate of functional neurotransmitter release per experimental animal. In some ways these earlier techniques provided data analogous to a photograph of an event. Microdialysis allows continuous sampling of the extracellular fluid in an individual animal so that it is more analogous to a videotape of an event as it takes place. In studies of epilepsy, microdialysis can be used to sample extracellular neu-rotransmitters, cellular substrates, or metabolites such as glucose or lactate and ions such as calcium or potassium. This sampling can take place in the preictal phase, during the seizure, and postictally. Thus, microdialysis allows an evaluation of the effects of a seizure on the solutes of interest. Microdialysis also can be used for studies of the distribution and metabolism of drugs. Several groups have carried out detailed pharmacokinetic studies of antiepileptic drugs in brain extracellular fluid while, in some cases, simultaneously measuring drug concentration in peripheral compartments such as blood or subcutaneous fluids. This technique allows a complete pharmacokinetic profile to be generated in a single subject. Many laboratories around the world have used microdialysis for studies in both animals and humans. As might be anticipated the bulk of these investigations have taken place in animals, but an increasing number of microdialysis studies are being carried out in humans.1-14 Microdialysis technique as it is used today was first described in 196615 and in 1969,16 but it became a routine research tool only in the last decade and credit for its popularity is due to Ungerstedt and Hallstrom.17 Since then, over 4000 reports have been published using a variety of microdialysis applications in humans, animals, and many kinds of plant. 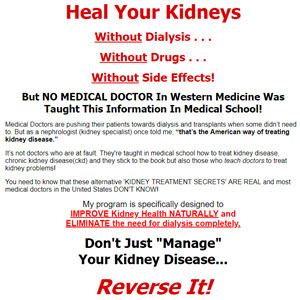 The increasing popularity and utilization of the technique is largely due to many improvements in commercially available materials, the availability of more sensitive analytical techniques, and constant refinements in the technique itself.18 While these improvements definitely have made microdialysis easier to use, it remains a technically demanding procedure. Individuals who wish to learn microdialysis to apply it to studies in their laboratories would be well advised to enroll in one of the microdialysis courses offered by equipment manufacturers or scientific societies. Alternatively, a visit to a laboratory with an ongoing microdialysis setup is worthwhile.